Scientists have confirmed for the first time that radical changes of one volcano in southern Japan was the direct result of an erupting volcano 22 kilometers (13.7 miles) away. 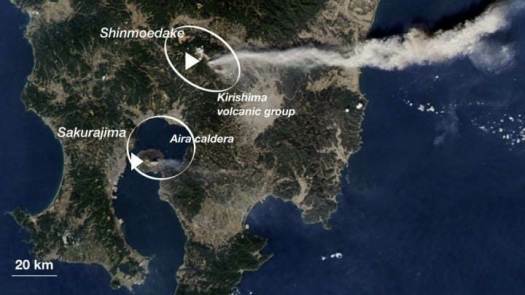 The observations from the two volcanos–Aira caldera and Kirishima–show that the two were connected through a common subterranean magma source in the months leading up to the 2011 eruption of Kirishima. Leading up to the eruption of Kirishima, which is located in the densely-populated Kagoshima region, the Aira caldera stopped inflating, which experts took as a sign that the volcano was at rest. The results from this new study, however, indicated that the opposite was happening–the magma chamber inside Aira began to deflate temporarily while Kirishima was erupting and resumed shortly after the activity at Kirishima stopped. “Now, we have to look whether this connnection is particular for these volcanoes in southeastern Japan or are widespread and occur around the world,” said Amelung.